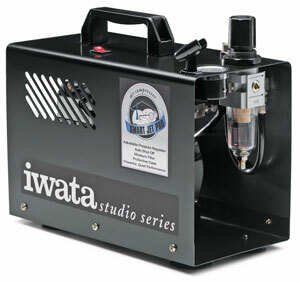 The Smart Jet Pro is great for the occasional or professional artist doing general airbrush applications. It can be summed up in four words: powerful, reliable, compact, and quiet. 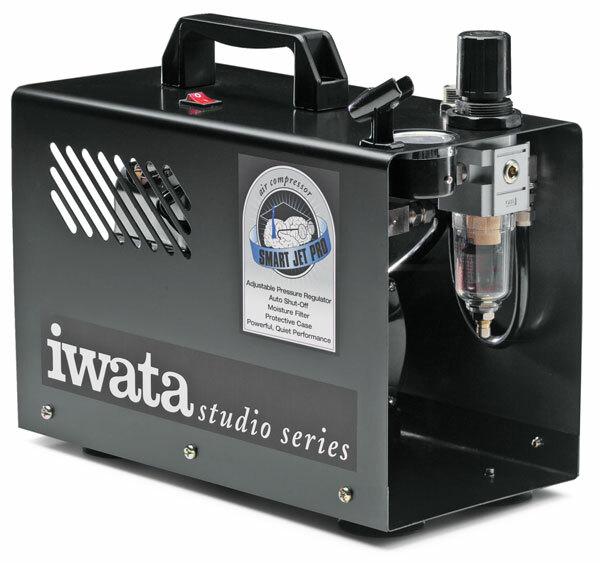 This maintenance-free, oil-less piston air compressor features a protective outer case and moisture filter with air regulator and gauge, which also prevents pulsation. The bleed valve adjustment releases moisture. Smart Jet Technology allows for less heat-related moisture buildup, full-capacity air on demand, reduced running time, less motor wear for longer compressor life, and inherently quieter operation that is suitable for public environments. The Smart Jet Pro automatically shuts itself off when not in use, reducing running time and motor wear. Other features include a carrying handle, high strength polyurethane air hose, and lighted on/off switch. The 1/8 HP motor delivers a working pressure of up to 35 PSI.